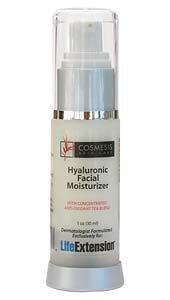 Cosmesis Skin Care Hyaluronic Facial Moisturizer will hydrate and protect your skin from within, producing younger, healthier and softer looking skin. 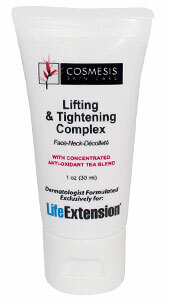 This nutrient enhanced facial moisturizer is recommended for mature, delicate, or dry skin types. The nutrient-enhanced Hyaluronic Facial Moisturizer hydrates and protects skin, producing younger, healthier, softer-looking skin. 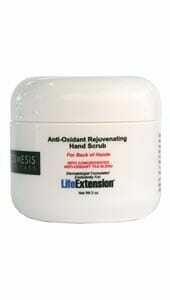 It is excellent for all skin types, but particularly beneficial for mature, delicate or dry skin. Use daily, especially after exfoliation. Ingredients: Purified Water, Jojoba Oil, Apricot Kernel Oil, Squalane, Hyaluronic Acid, Laureth-7, C13-14 Isoparaffin, Polyacrylamide, Phenoxyethanol, Ethylhexylglycerin, Propylene Glycol, Concentrated Tea Blend Extract, Oil of Kumquat. Will soften, moisturize, and protect skin. 1. 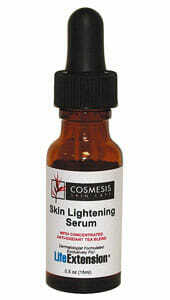 [Skin hydration and hyaluronic acid].